Out in the high desert of southern Utah, we follow a narrow path among pine and fir. Suddenly the horizon opens up and we emerge onto the edge of a plateau. Below and beyond a maze of eroded rock stretches as far as the eye can see. The power of the Colorado River and it's many tributaries, continue to mold a meandering path through the fragile sandstone. 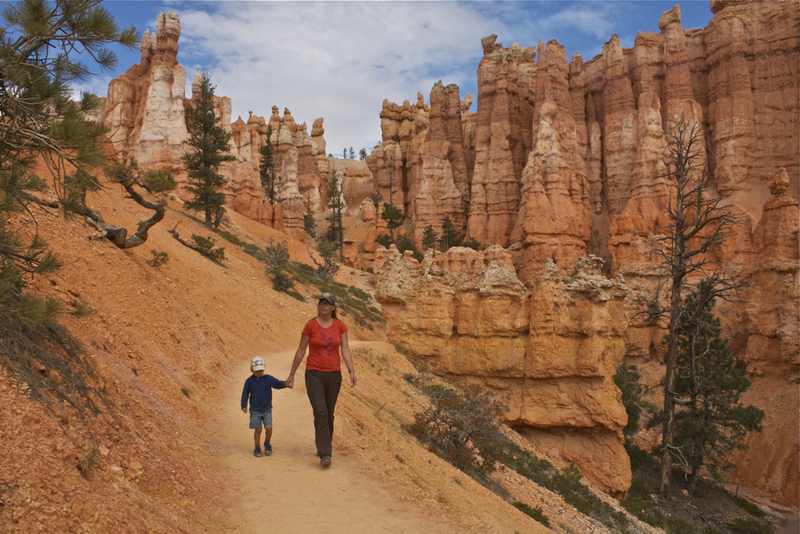 The jagged spires of Bryce Canyon stand guard again the impending forces of nature, castles made of sand, fragile relics of a landscape shaped by the relentless forces of water over countless millenia. Under the bright blue autumn sky we descend below the canyon rim, into a magical landscape. In the labyrinth of narrow canyons we can envision mythical characters hiding behind nooks in the rock walls. We meander along a beaten path appreciating the natural wonders of nature at a pace that allows us to let the scale of place sink in. We contemplate not only the size of the pinnacles and rock walls, but the scale of time, each raindrop that contributes to the constant erosion and morphology of this spectacular place.